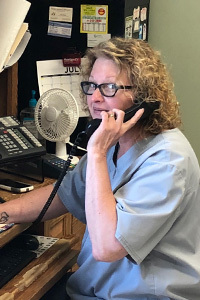 Terri joined the Rushville Veterinary Clinic in 2003 after working 19 years in the dental field. She works in both Rushville & Mt. Sterling Clinics as a receptionist. Terri lives in rural Timewell with her husband Jeff. They have 4 children, 7 grandchildren. They share their house with 2 dogs---“BUD” and “STEVIE” who keep them entertained.